There are plenty of compelling reasons why the Senate should refuse to act on whoever Trump nominates to replace Justice Kennedy on the Supreme Court. Of course, there is the fact that the Republicans stole outright the last Supreme Court seat by refusing to even hold hearings for President Obama's nominee. There is the need to confront their hypocrisy in using as a pretense for such obstruction that the confirmation process should not be held in an election year. And there is the grave concern that anyone Trump nominates will, based on the list he has already provided, cement a far right wing majority for a generation or more and send us hurtling back to the dark ages. These issues have predominated the discourse since Kennedy announced his decision to pack it in. What has mostly been missing from the various talking points, particularly those of the Democratic leadership, is how inappropriate it would be for a president to nominate a Supreme Court justice while under investigation for cooperating with a foreign power that helped get him elected. 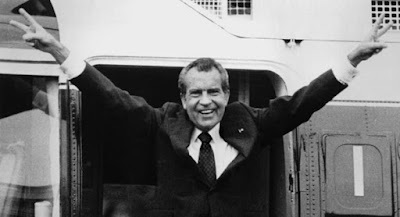 At the end of January 1973, a month into Richard Nixon's second term in office, two officials of his re-election committee (CREEP) were found guilty of conspiracy, burglary and bugging the Democratic Party’s headquarters at the Watergate office complex. Others had already pleaded guilty. A week later, in early February, the Senate established a Select Committee to investigate what had become a full-blown scandal. Nixon's top aides, H.R. Haldeman and John Ehrlichman resigned in April, and the Senate's televised hearings began in May. The rest is history. There would not be a Supreme Court vacancy during Nixon's truncated second term and so the issue of confirming a Supreme Court justice during this constitutional crisis never came up. But imagine if it had. Do you think there is even the remotest possibility that the Senate would have simply gone ahead and held confirmation hearings as if there weren't "a cancer on the presidency," as Nixon's former counsel John Dean put it? Well the cancer has returned and under this presidency it has metastasized. There have been Saturday night massacre-type firings, recusals, indictments, guilty pleas and Congressional hearings. There is already enough evidence in the public sphere to establish Trump campaign officials' connections to Russian efforts to throw the election to Trump as well as Trump's own attempts to obstruct the investigation into those connections. If it is true that Trump cooperated with Russia's election meddling or that Russia succeeded in obtaining some form of kompramat giving them some power over Trump, then everything he does as president is devoid of legitimacy. And that certainly includes selecting a justice to serve a lifetime appointment to the Supreme Court. Shouldn't we at least wait to see the results of Special Counsel Mueller's investigation before moving forward on what may be a nominee from an illegitimate president? But even more than this, the Supreme Court will likely soon have on its docket cases brought by Trump and members of his Administration that directly relate to the Mueller investigation. Issues likely to appear before the Court include whether a sitting president can be indicted, whether a president can be forced to testify, whether a president can pardon himself. Since whoever he picks to sit on the Court would play such a critical role in deciding these and other potential issues directly impacting his liability, Trump has a debilitating conflict of interest in choosing a nominee. Democrats need to focus less on trying to shame Majority Leader McConnell for his hypocritical power plays because he can't be shamed. And, in any event, this isn't merely about Senatorial gamesmanship but about fundamental democratic principles. The sad reality, however, regardless of whether we are talking about the nomination in terms of abuse of power or Republican hypocrisy and obstruction, is that elections matter -- even those tainted by Russian interference and Trump collusion. Republicans hold a 51-49 majority (with Pence as a tie-breaker), which means the Democrats need to not only keep their members unified but convince two Republicans to cross over and oppose a Trump nominee. This means making sure those conservative Democrats running for re-election in red states understand that they will need the support of their base, and particularly Democratic women who support Roe v. Wade, and they will lose it if they play along with the Republicans on this nomination. And it means pressuring Senators Collins and Murkowski, two women who purportedly support a woman's right to choose, to put their votes where their principles are. We also must demand that Democrats throw sand in the gears of the Senate to hamper the Republican's rush to confirm a nomination before the mid-terms. They must use whatever procedural and technical tools at their disposal to shut down or at least slow down Senate business, including refusing unanimous consent that typically expedites hearings and exploiting rules that encourage free and open debate. It is far past time for the Democrats to abandon their crazy-making deference to civility and norms. They need to emulate Maxine Waters, not shun her. This Supreme Court vacancy presents a key opportunity to mobilize voters and frame the issues in advance of the midterms. (You know Republicans will be doing the same with their anti-choice base.) I can think of no better way to deflate the passion and energy of liberals and progressives than to witness another tepid response by establishment Democrats to the incessant and dire threats to our democracy. Even if this is ultimately a losing battle, it is one badly worth fighting for.